Never in my life have I felt so conned, cheated and lied to. No, I didn't get conned into buying a fake Chanel 2.5 bag nor did I mistake £10.00 for £100.00 credit in my account. (Both of these incidents did actually occur believe it or not). It was worse that that. In fact, as I type this blog I feel a shudder run deep down my spine. 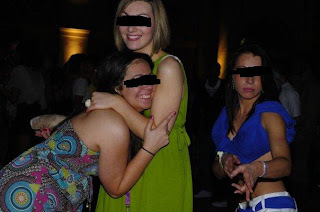 When I was forwarded an invitation (from my beloved facebook) of the Miami Beach Party I signed up. On the run up to the event Kiss and Choice FM were equally advertising the event like no man's business. Every advert and every plug was for the "biggest, baddest beach party you're ever going to attend" or some cringeworthy cheesy lyrics along the lines of that. Every five minutes Miami Beach Party get your tickets!!! Miami Beach Party get your tickets before they run out!!! 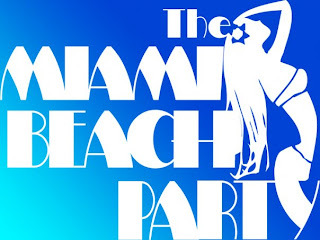 Miami Beach Party get your bikinis and shorts ready!!! 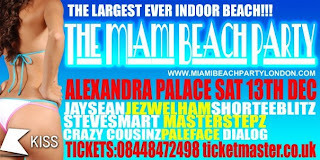 Mainly in association with Kiss FM, The Miami Beach Party held in North London's Alexandra Palace, was meant to be the "largest EVER indoor beach event" hmmm I wasn't so sure when I stepped into the hall. There were two large sandpits and in the centre was the DJ with all the ravers..a mere 400 of them. Even though surprisingly I received a facebook message that stated up to 3,000 guests arrived...erm...are you sure?! Ticket buyers were promised:- "Stylish Summer Wear" and instead we got "Sleazy Slutty Wear" and that's by the people who made the effort! Several of the guys still had their leather jackets, hats and scarfs on. And no they were not the only people who were feeling rather chilly, in what was meant to be "28 degrees of heat". Are you noticing a pattern here?? Think someone has taken the little white lie thing a bit too far. The biggest disappointment wasn't the lack of plastic palm trees or the lack of people or the fact that the only way to buy drinks was to exchange money for "tokens" (which in itself was a big palarva). The main disappointment? Jay Sean, chart-topping RnB artist, didn't turn up. Don't get me wrong, I am not his biggest fan, but if I was I wouldn't exactly be thrilled at his no show, would you? What made up for the lack of innovation and atmosphere of the most hyped up events of the season get was that the line up who did turn up (Shortee Blitz, Masterstepz and Donaeo) did their part well the crowd went crazy! Would I go again? Would you stab yourself in the eye a second time? Well there is your answer. 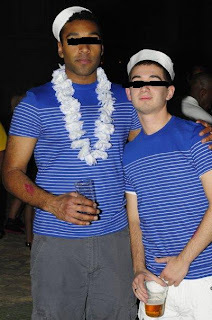 I couldn't end this magnificent blog without showing you the best (and worst) offenders of beachwear. It's beyond beggar's belief that ladies dress up in the most BIZZARE outfits. If they wanted that kind of attention they should give my main man Maury a call. He'll hook 'em up! But on a serious note - what kind of person would I be if I didn't show my praise and offer my advice tips for people?! :-) Enjoy! How NOT to wear a silver shine cut-out swimsuit..teamed with super tight and shiny leggings-Gheez Louise save the leggings for another outfit child!